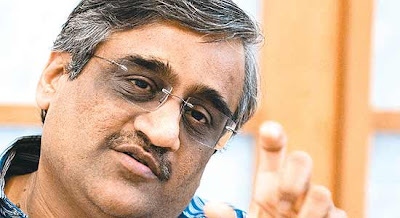 Kishore Biyani, Managing Director, Pantaloon Retail. Pantaloon Retail (India) Ltd (BSE: 523574, NSE: PANTALOONR) on Friday, 18th May 2012, witnessed a stake upping by the FII sub-account, Arisaig India Fund Ltd, through a market buy of 14.23 lakh shares in NSE. The deal was disclosed by National Stock Exchange after trading hours on Friday. Arisaig India Fund is registered under the Singapore headquartered FII, Arisaig Partners (Asia) Pte Ltd, which is part of the global fund house, Arisaig Partners, which has an exclusive focus on domestic consumer sectors in countries like Singapore, China, India, South Africa, Brazil, & UK. This fund had emerged as a major holder of Pantaloon Retail stock in March 2011 quarter, and in the most recent Q4 of FY’12, had become the Indian retailer’s largest non-promoter shareholder with a 6% stake. Friday’s buy by Arisaig was at Rs. 143.27 a share and the 14.23 lakh shares it acquired amounts to a further 0.69% stake bought at Rs. 20.39 crore. Interestingly, Friday was also witness to a regulatory disclosure by Arisaig India Fund in BSE & NSE, where it divulged that on 4th May 2012 it had acquired a 2.11% stake in Pantaloon Retail. However, the disclosure also reveals that this FII must have sold a 0.95% stake somewhere between April 1st and May 4th. Anyway, with Friday’s purchase, this global retail-sector investor’s stake in India’s retail-sector major stands at 7.84%. Arisaig’s first major purchase of Pantaloon in Q4 of FY’11 was when the average quarterly share price was around Rs. 302, and its near tripling of stake that happened in Q4 of FY’12 was when average quarterly prices were around Rs. 164. Its 2.11% acquisition in early May was when the average price was at Rs. 174, and its continued accumulation on Friday at Rs. 143 level hints at a strategy of averaging at lower and lower prices, and occasional opportunistic sells. In another interesting development on Friday, Future Corporate Resources Ltd, a promoter group company disclosed in Indian Exchanges that it had upped its stake in Pantaloon Retail by 0.40% through market purchases on Thursday. Pantaloon Retail is all set to hive-off its flagship Pantaloon format stores to Aditya Birla Nuvo for a consideration of Rs. 1600 crore. The move is designed to reduce the debt burden of this Future Group venture, promoted by organized retail's pioneer in India, Kishore Biyani. The Future Group itself is undergoing a restructuring to accommodate this deal, and as a part of this exercise, on Friday, the Group's listed financial arm, Future Capital Holdings Ltd (BSE: 532938, NSE: FCH) saw its main promoter company, which is Pantaloon Retail, transfer a 38.58% stake to its wholly owned subsidiary, Future Value Retail Ltd. In an earlier regulatory filing, Future Capital had announced this intention of its promoters, of which only a part is now complete. Earlier, the market had taken it as a negative cue, as the stake was moving from the standalone Pantaloon Retail to a subsidiary even though it is wholly owned now. Major investors in Pantaloon Retail are Macquarie Bank, IDBI Trusteeship Services (India Advantage Fund V), ICICI Prudential Life Insurance Company, Bennett Coleman & Company, Dharmayug Investment, MKCP Institutional Investor (Mauritius), FID Funds (Mauritius), Reliance Capital Trustee Company, Life Insurance Corporation of India, Rekha Rakesh Jhunjhunwala, and Tradewinds Global All Cap Portfolio. Driven by buying support at lower levels of its current trading range, Pantaloon Retail closed trade in NSE on Friday at Rs. 138.55, up by 5%.